It was another big year for drones at CES, and Half Chrome was there to see what was new. There was plenty to see and there are some new and exciting things on the horizon. We will go through some of the most interesting drones that we saw at CES. Jump to the section that interests you most or read them all. One of the most exciting bits of news was that GoPro is going to announce the re-release date of the Karma drone next month. Yes, the Karma was at CES, despite what the folks at CNET said (clearly their drone reporter didn’t make it over to the camera section of the conference where GoPro was located). We talked to one of their engineers who described the problem that disrupted the Karma’s initial launch. It turns out that the plastic parts on the battery and the mating connector were out of spec, causing the batteries to wiggle loose in a small quantity of the drones they produced. The issue has been resolved, and we should expect to see the Karma back on the shelves soon. We like that GoPro positioned the camera far forward to eliminate any chance of prop blur or seeing the motors. With the recent release of the Mavic Pro and Phantom 4 Pro, DJI didn’t have any new big announcements at CES. They had four official announcements including an update to their Osmo Mobile handheld gimbal, a Chinese New Year themed Phantom, new CyrstalSky monitors, and some new advanced mapping software called Ground Station Pro. Half Chrome can confirm that those monitors look really nice in person. Check out the official DJI press release for more information. Autel announced two new camera upgrades for their X-Star drone. They have created a 4K camera with a 1-inch sensor which we expect to compete well with the Phantom 4 Pro. They also announced compatibility with the Flir Duo, a combined infrared and normal visual spectrum camera that is the size of a GoPro. The camera upgrade announcement highlights one of the key advantages to the Autel platform. Unlike the DJI Phantom lineup, you won’t need a new drone every time you want to upgrade the camera. Yuneec made an announcement at CES about a new 6-Rotor Typhoon model called the H520. This 6-prop drone can support a host of new cameras including the CGO-3+, the upgraded CGO-CI, which is designed for filmmakers and broadcasters, and the CGO-ET, which is a dual low-light and IR thermal camera that is designed for law enforcement. This announcement shows that Yuneec is getting serious about professional videography and other commercial applications. We were excited to see some waterproof drones at CES this year. SwellPro came with their Splash Drone. Someone must really like them, because when we were at the SwellPro booth the CES security staff was investigating the recent theft of SwellPro’s orange quadcopter from the swimming pool it was floating in. Everything from the camera to the gimbals, to the brushless motors is waterproof. They say that they put a coating over the motor’s coils and magnets to protect the parts from corrosion. The air vents on top of the drone are covered with waterproof films to let air in but keep water out. We hope we can test one of these innovative drones in the near future. There were not many racing drones at CES that are worth mentioning, but one we really enjoyed talking to was UVifly. They provide consumers with a ready-to-fly racing drone that saves them from the challenges of assembling a drone, pairing a remote, and tuning the drone. The drones are completely modular, so if a part breaks it is pretty easy for the novice to install replacement parts themselves. These are the fastest ready-to-fly racing drones on the market. They also have a super-realistic flight simulator that will allow beginners and experts alike to hone their skills. The simulator was much more realistic and accurate than another one we saw at the DJI booth, of all places. PowerUp Drones won a CES innovation award this year for their latest paper airplane drone that comes with FPV and improved stability features. We like the idea of motorized paper airplanes, but we will have to see if people are willing to spend $199 on a paper airplane. Their CEO told us that the FPV model has return-to-home and enough stability to fly outside in light wind. Our favorite feature is the siren on the drone which will sound off if the drone flies out of range or if you press a button on the remote. No more lost drones! As far as we know PowerUp is the first with a feature like this, and we would love to see a siren like this on all small drones. Their original models, the PowerUp 2.0 and 3.0 are much more affordable and better suited for people who just want to experiment with simple paper airplane powered flight. A nice feature of all of the PowerUp drones is that if you damage the “frame” you can simply fold up a new one with copy paper. If you want something a little more sturdy than paper, we recommend one of the easy-to-fly planes from TobyRich. They demonstrated their biplane model for us in their booth. Their latest model flies faster and has FPV but it is still super durable due to the drone’s light weight and material selection. We really like TobyRich’s innovative suction-cup sliding joystick that you press onto your smartphone. This clever device produces a much more sensitive feel than the traditional touch-screen control of smartphone-controlled drones. The folks at Bionic Bird were nice enough to send us home with one of their bird-inspired flapping fliers. They are realistic enough that they get attacked by birds of prey, so we will be careful where we fly ours. While the Bionic Bird is not the first drone of its kind, it may be the one that makes a larger impact on the consumer market. The control mechanism, which tightens one wing while adding slack to the other, is an invention owned by the folks at Bionic Bird. Of course, wing warping has been around since the Wright brothers used it on some of the first aircraft ever built. Look forward to a full review of this flapping drone from Half Chrome in the next few days. Cleo was the selfie drone that we found most interesting at CES. They won a CES Innovation Award for their dual prop drone that can fit in your pocket. Their CEO Omar Eleryan and CTO Simon Czarnota were manning the booth, but they were tight-lipped about how the drone is able to maneuver. We can’t prove it, but we suspect that they have internal weights that move around to change the balance of the drone. We can’t wait to get our hands on one and see how it performs. It is definitely the most compact at easy to handle of the selfie drones. The Hover drone also won an Innovation Award at CES. We spoke with a marketing representative who told us that they didn’t think of themselves as drone manufacturers and they didn’t want people evaluating their cameras because image quality wasn’t their focus. So a selfie drone isn’t intended to take nice pictures and it is not a drone??? We left their booth more than a little bit confused. If you do want to take nice selfies you might want to hold out for the first deliveries of XCraft’s PhoneDrone Ethos. If you aren’t afraid to put your smartphone in the air, then you should be happy to know that your selfie drone just might be capable of taking sharper images than a DJI Phantom. Check out our article about this drone for a side-by-side comparison. CEO JD Claridge tells us that their first release model will now come with 5-sided obstacle avoidance. The new addition of obstacle avoidance is a big enhancement, and it should make you feel more comfortable about putting your iPhone 7 up in the air. This drone can also float on the water, so no need to worry about losing your phone, or your diamond-bedazzled phone case, at the bottom of a lake. We only saw one consumer drone at CES that is specifically designed for 360° video capture. The Zmodo drone promises to deliver obstruction-free 360° video. Primarily a security camera company, Zmodo is partnering with Airmada on this drone. Unfortunately, you will need to wait for it to be released. While you are waiting for a true 360° drone, you might want to check out the higher end 360° camera offering from Kodak. We hope to get our hands on two of their Kodak PIXPRO SP360 4K models. Using these two cameras is likely the preferred way of capturing drone footage since you can put one on the top of your drone and one on the bottom. Professional videographer Todd Harper was in the booth to tell us about how he did just that with a 3DR Solo. We also got word that Kodak is planning to work with DJI to make mounts for the Mavic. It’s already been tested and the Mavic can still fly well with two cameras strapped to its body. Kodak is coming out with a dual camera with full 360° model in a couple months, but that likely won’t be the preferred option for drones unless you don’t mind seeing some obscuration from the drone. The PIXPRO SP360 Dual Pro Pack allows you to split the camera and put one up top while the other sits under the belly of the drone. At Half Chrome we are also waiting to get our hands on the Insta360 camera. This little guy can plug directly into an iPhone so the phone can serve as your live view of what the camera sees. Spoiler alert, it sees everything. The camera also has a removable micro SD card so you can use it as a stand-alone camera. At a $199 price point, this will be the most affordable way to capture decent quality 360° footage. The most impressive 360° footage we saw at CES was at the GoPro booth. They are able to produce awesomely detailed video by using six GoPro Heros in an Omni Rig mount. With a lot of stitching and post-processing you get really good results that produce VR-ready videos or stunning effects on a 2D screen. But that camera rig is pricey when you add up all those cameras. You will actually need two of Omni Ring Mounts, for a total of 12 GoPros, to avoid obscuration from the drone. That’s a bit much to load up on the back and belly of a 3DR Solo or even a larger drone like the DJI Inspire. So for now, your GoPro cube will likely be staying grounded. The folks at SkyViper were grabbing attendees’ attention with their drone shooting range at CES. SkyViper is executing on a very exciting plan to put GPS-enabled drones with live streaming FPV in the hands of eager consumers at a price under $200. They said this new model should be available in a few months. If they pull it off, it might be the best toy drone of 2017. With that many features, you probably can’t call it a toy anymore. Until that drone is ready you can check out the latest price on their complete FPV package here. The Micro Drone 3.0 from Extreme Fliers continues to impress in the mini drone category with their unique simple-yet-elegant design. We have heard reports that the image quality from this little guy beats out other drones in this class, but we have yet to test one ourselves. Their team at CES told us to expect image stability in the next release, with a 1-axis up/down tilt gimbal and electronic stabilization for the roll axis of the drone. We are excited to see something very different in this category of miniature small drones, which is otherwise saturated with under-performing featureless cameras. Propel was at CES promoting their line-up of Disney-approved Star Wars drones. With altitude hold, infrared guns, and infrared sensors, the specs are impressive on these mini drones. We recommend you pick up a 3-pack so you can battle with your two closest friends, or your two worst enemies if they happen to support the Dark Side. Each drone comes with an infrared transmitter and sensor so the drones can play a sort of aerial laser tag. Propel is currently promoting a collector’s edition of their hand-painted drones that come in unbelievable packaging. With an LED-lit case, the box is more of a display case than it is packaging for delivering you a drone. People are buying these just to show off as a display item in the office. Others are boxing them up hoping they increase in value in a few years. We just hope someone actually flies them. Mota had a large presence at CES with a lineup of mostly toy drones. One interesting drone is their micro drone with FPV. It seemed to fly better than the Cheerson CX-10W that we have tested, and it sports a better HD camera. They also had the smallest nano drone we have ever seen. It comes with a remote that can house the drone for transport. Moto has some new angles on toy drones with a pair of LED-lit quads that are intended to be slammed into each other until only one survives in the air. Finally, they have a 6-prop drone with 3 arms that we would love to try. For a company with great design sense and good execution, look no further than Power Vision. A few months ago they made headlines with their egg-shaped folding drone . We have to admit that it does look pretty cool and there didn’t seem to be many design sacrifices made in order to achieve the perfect egg shape. They also came to CES with a submersible fishing drone that won a CES Innovation Award for 2017, shown below with the Power Vision mermaid. 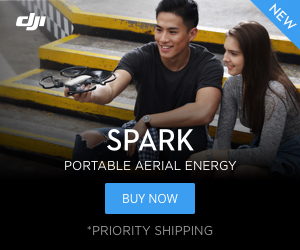 Their other new development is a drone intended to compete with the DJI inspire. 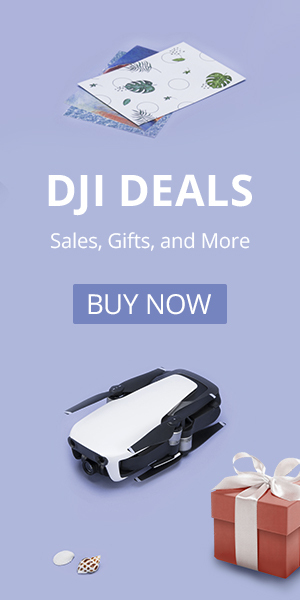 The folks at Power Visiown tell me that they intend to provide a lot more value for their customers with this drone by including more at a lower price point than DJI. The Yi Erida tri-copter was getting some attention for its unique design. Primarily a camera company, Yi partnered with Atlas Aerospace to produce this drone. Yi uses a motor to tilt the 3rd arm in order to achieve yaw control. Another unique feature is that the drone uses a laser on the bottom to measure the distance to the ground rather than the sonic sensors that have become common on many drones. Yi is currently seeking investment and they are not ready to sell their drone commercially. Tiffen won an innovation award at CES for their unique handheld gimbal that is powered by a partnership with drone-maker Yuneec. We are not 100% sure how it works, but we tested it and can confirm that it does work as advertised. It was very clear at CES that the handheld gimbal market is quickly becoming saturated with products that all look nearly identical, but the Tiffen gimbal is something different. The Tiffen gimbal was designed, in part, by Garrett Brown, the same engineer who designed the first steady cam that was used in movies like Rocky. Tiffen is also finally launching a long-awaited line of filters for DJI and Autel drones. Tiffen filters have won Academy Awards, and now they are available for drones. The filters should be available soon, and we will show you our results once we have a chance to test them. Ehang was at CES again this year with their giant human-flying drone. We don’t think you will be buying that drone, and you also likely won’t be getting the Ghost drone because it’s downward props will just get in the way of your video capture. Ehang did, however, bring the biggest drone to CES, so they deserve some kind of prize for that. Pingback: What's the most innovative drone at CES this year?